There’s no way to sugarcoat it. As we embark upon a new year, the Chicago Blackhawks are struggling. They headed into the Christmas break in a rut and have now come out of the break much the same. The Hawks are in the midst of a six-game road trip, and it hasn’t been pretty. They fell 5-2 to the lowly Vancouver Canucks last Thursday before taking on the Edmonton Oilers the very next night. In this one, they were ahead 3-1 but gave up their lead and headed to overtime. The heroics of Patrick Kane fortunately gave them a 4-3 win. Lo and behold, it was the Hawks’ turn to come from behind on Sunday, New Year’s Eve. They were down 3-0 but actually fought back with three goals of their own to force another overtime. But neither Kaner nor anyone else pulled them out of this one, and they fell 4-3 in the end. So the Blackhawks picked up three of a possible six points this past week. Not too horrible, right? But their entire season has been mediocre at best, and at this stage, every point counts if they want to see the playoffs in the spring. They have to do better than this. Let’s dig a little deeper. 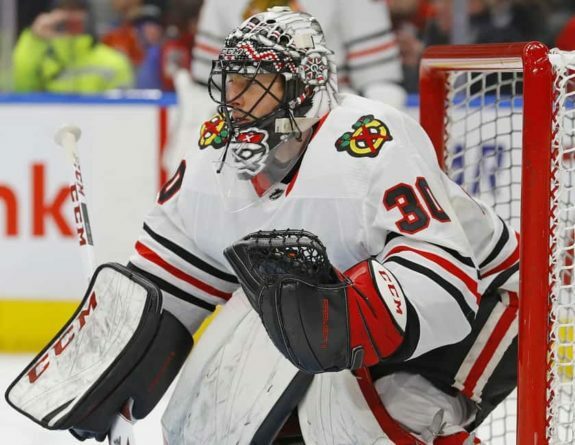 The Blackhawks announced last Wednesday, Dec. 27, that goaltender Corey Crawford was placed on injured reserve for a mysterious upper-body injury. 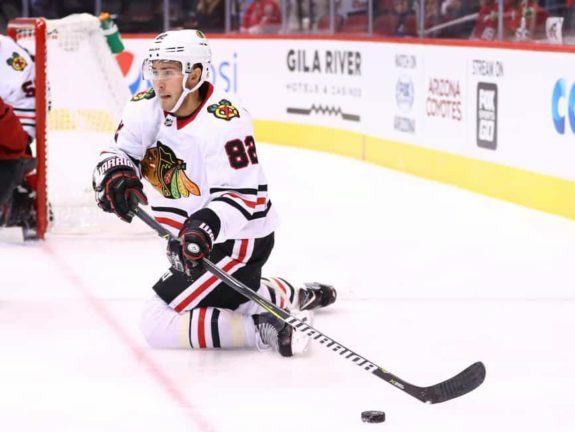 The Hawks are being very tight-lipped about his ailment, which is different from a lower-body injury he sustained earlier in the month of December. There is also no timetable yet for his return. In his place, the Hawks called up relative-unknown Jeff Glass from the Rockford IceHogs, along with center David Kampf. Center Artem Anisimov was also placed on injured reserve after leaving the Vancouver game in the first period on Friday. Defenseman Cody Franson was activated off IR. Oesterle has now lined up alongside Duncan Keith on the first defensive pairing for the last nine games. His spot in the lineup coincided with Franson getting injured, but he proved he should stay because of solid play. He took that one step further this past week. In Vancouver, Oesterle recorded a team-high six shots on goal. The very next night in Edmonton, he scored his first NHL goal on the power play. He also blocked seven (!) shots. He topped it off with another goal and an assist against the Flames on Sunday. It looks as if Oesterle has also taken Brent Seabrook’s spot on the power play. While Seabs normally plays the point on the second power-play unit, Oesterle has done so in the last two games. Oesterle recorded 1:07 and 1:43 minutes on the man advantage against Edmonton and Calgary, respectively. Seabrook didn’t play on the power play at all. It appears that Oesterle is definitely earning his keep. For the better part of the season, this tandem has played together on the third defensive pairing for the Blackhawks. But they had such a horrific game against Vancouver that Coach Q had had enough. Both players were on the ice for three goals against where they got caught extremely out of position. They’ve been healthy scratches ever since, in favor of Michal Kempny and Franson. With these two playing well, I wouldn’t expect Forsling or Rutta to draw back in, especially after a win and a close overtime loss. In all three of this week’s contests, the other team has been the first to score. As a matter of fact, this has been the case for the past five games, four of which have been losses. The last time the Blackhawks scored first was against the Minnesota Wild on Dec. 17. And guess what? They won the game. If the Hawks are going to start winning again, it needs to begin with stronger starts. Be the first to score, and then carry that momentum. There was something a little different about Sunday’s game against the Flames. The Hawks were down 3-0, yet they fought back to tie it and force overtime. Pretty much all season, when the Hawks are in a hole, they appear to give up. Unlike past years, mounting a comeback seems like too much effort for this team. But this past game is where the Hawks may have turned a corner. A new defenseman (Oesterle) gave them a spark by scoring for the second time in two games. The Captain (Jonathan Toews) snapped out of his rut with a two-point game and his 10th goal of the season. He hadn’t scored a point in the last six games. And Brandon Saad added a clutch goal at the end of the third period. One could take this argument back to the Edmonton game as well. The Hawks gave up a lead, but Kane grabbed the win back with his overtime goal. The Hawks may be as tired of losing as the fans are of watching them lose. Perhaps they are ready to fight and claw and dig a little deeper. Netminder Jeff Glass made his NHL debut at 32 years of age against Edmonton this past Friday. Who is this Glass guy, you ask? That’s a good question. In 2005, Glass won a gold medal with Canada at the World Juniors with the likes of Sidney Crosby and Patrice Bergeron. But since then, he’s wallowed in hockey obscurity. That is, until injuries and circumstances led to this start. Glass’s debut was also his first NHL victory. He stopped 42 of 45 shots for a .933 save percentage in the win. He played so well, it earned him the start in the next game. That one didn’t go as well (an overtime loss where he only stopped 35 of 39 shots for a .897 save percentage), but Glass’s first game certainly was a feel-good moment for him and for the Hawks. Kampf was recalled at the same time as Glass, and has been centering the third line. He’s gotten off to a slow start, only generating one shot on goal in three games. But he’s taken a bulk of the faceoffs behind top centerman Toews, especially with Anisimov out on injury. He’s managed faceoff percentages of 55, 45, and 43, respectively. Considering Anisimov has a 47.1 faceoff percentage for the season, this isn’t bad for the rookie. Depth down the middle is certainly a weakness for the Blackhawks. 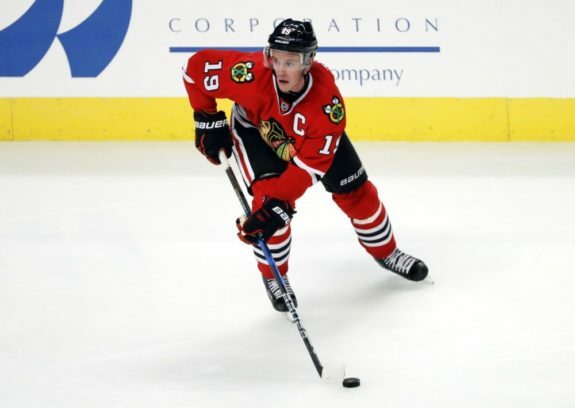 There are many theories about why Toews’ game is struggling, and excess workload is one of them. The hope is that Kampf could help with both these things. It’s not going to get any easier for the Blackhawks. They’ll start out the new year Wednesday night with a tilt against the New York Rangers, who currently hold third place in the Metropolitan Division. On Friday night, they finally return to the United Center to host the Vegas Golden Knights, the expansion team that ranks second in the entire league. Finally, they face the Oilers again on Sunday. This is the team they just beat in a close overtime matchup. They will be out for revenge. The Hawks’ record of 18-14-6 (42 points) puts them in second-to-last place in the Central Division, and well out of a wild-card spot. But the race is tight, so some wins could paint a different picture next week. Stay tuned!